Although it had long been suspected that obesity ages a person faster, it hadn’t been possible to prove the theory until now, said study first author Steve Horvath, a professor who holds joint appointments in human genetics at the David Geffen School of Medicine at UCLA and in biostatistics at the UCLA Fielding School of Public Health. The research, conducted with Jochen Hampe of the University Hospital Dresden, showed that carrying excessive weight can negatively affect certain tissues in the body. The findings appear online in the peer-reviewed journal Proceedings of the National Academy of Sciences. The epigenetic clock, which Horvath developed last year, uses a previously unknown time-keeping mechanism in the body to accurately gauge the age of various human organs, tissues and cell types. He and his collaborators focused on a naturally occurring process called methylation, a chemical modification of the DNA molecule. Horvath used the clock to measure the biological age of several tissues, and it proved accurate in matching biological to chronological age in leaner people. But liver tissues from obese people tended to have a higher biological age than the researchers expected. Horvath studied almost 1,200 human tissue samples, including 140 from the liver, to study the relationship between epigenetic age acceleration and body weight. He and his collaborators found that although obesity doesn’t affect the epigenetic age of fat, muscle or blood tissue, found that, on average, the epigenetic age of the liver increased by 3.3 years for every 10 body mass index, or BMI, units. For example, a woman who is 5-foot-5 and weighs 140 pounds has a BMI of 23.3. A woman of the same height who weighs 200 pounds has a body mass index of 33.3. The study found that her liver would be about three years “older” than that of the lighter woman. Horvath also found that rapid weight loss induced by bariatric surgery did not reverse the accelerated aging, at least in the short term. 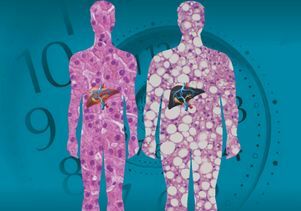 Going forward, Horvath and his team want to determine if the premature epigenetic aging of liver tissue in obese people can be prevented, which might help reduce their risk for diseases like diabetes and liver cancer. The researchers plan to work on models that allow them to determine the exact molecular mechanisms behind this aging process — which are not known at this point — in order to find targets for therapy and prevention. The study was funded by the National Institutes of Health (NIA/HIH 5RO1AG04511-02), the Virtual Liver Network, the Christian-Albrechts-University Kiel and the University Hospitals Schleswig-Holstein and Dresden in Germany.